In part 2, we discuss the adventure designer program, how to create you own adventure, the club and newsletter for Imagery!, and how this blog came to be. As described in the previous post, Imagery! was completed in October, 1986 and Dr. Evil Labs began distributing it in January, 1987. The adventure designer, however, was not released until March, 1988. What happened? Sadly, I don’t have any notes describing the details of the long delay. The August, 1987 issue of The Image makes reference to “unexpected difficulties” and states “the problems are mostly solved now, so the designer is nearing completion”. What’s The Image, you ask? (Let’s take a little detour so that I can put off making excuses for the delay as long as possible!) This was the official publication of Imagination, the club associated with Imagery! (Sheesh, the close similarity of the names of all of these things seems very corny, 25 years later!) Even though response to Imagery! was pretty tepid, we soldiered on and completed Volume 1, Number 1 of the newsletter during summer break after the 1986-7 school year. Vince Martin drew some wonderful artwork and Dan Moore, a friend from high school, helped quite a bit with inspiration and by writing some product reviews. Fellow Purdue student and CBM hacker Rob Tillotson wrote a nice article on GEOS (planned to be part of a series). We even had a few letters from customers and pre-announcements for a couple of software utility disk packages. The lead article was a trip report from the just-concluded, first-ever SIDfest in Columbus, Ohio, which Dan and I attended, along with another St. Paul-area friend, George Newton. Continuing the buddy-movie theme astutely observed by Thomas Ferguson, I recall that George and I met that summer on a local BBS, of which there were very few in the semi-rural area in which I resided. I experimented with running a BBS on my C-64 that summer while I was at home. I was working the night shift at a factory and ran the BBS during the day while I was asleep and my mom was at work. V1N1 was the one and only issue of The Image. I hoped that Imagery! enthusiasts would contribute articles and that I could mostly function as editor and publisher, but alas, nothing materialized. I’m not completely sure why I didn’t buckle down and crank out one more issue to coincide with the release of the adventure designer, although I bet it had to do both with being increasingly busy with school and with spending time on Dr. Evil Labs’ next product, the SID Symphony stereo cartridge. Let’s get back to the adventure designer’s delayed release. I recall that the “unexpected problems” were technical in nature. I believe one issue was making the writing of relative (random access) files reliable, which Ray ended up solving via assembly language. I also recall that the main designer program was very large and we essentially ran out of RAM to store data that the program needed to manipulate (the adventure being created). Ray took on the messy task of writing more assembly language to copy the Kernal ROM and BASIC ROM to RAM and relocating the BASIC ROM image upward so that BASIC gained 4K of program space. He succeeded in grand style, which allowed Roy to finish the program. Ray’s fancy bit of ROM relocation footwork exposed an incompatibility with a popular product that did not exist when Imagery! was created, namely, JiffyDOS. In November, 2012, Ray was able to isolate the problem, thanks to the cool debugging possible with the VICE emulator and his skill with C# and 6502 assembler. It seems that JiffyDOS shifted the entry points of a couple BASIC routines, so Ray’s relocation code needed to change to match those new entry points. Voila! Imagery! Adventure Designer v1.1 was born, which is fully compatible with the latest and final JiffyDOS, version 6. Thanks, Ray! Just for fun, here is the copyright certificate from March, 1988. And here is the promo sheet. And here is Imagery! Adventure Designer v1.0, the original release, for historical purposes only. It does not work with JiffyDOS and is not recommended for use today. If you have slogged through the post this far, you at least “deserve” the answer to the music quiz question from the previous post: The tune used during the Imagery! splash screen is Orlando Sleepeth, written by composer John Dowland in the late 16th or early 17th century. The splash screen shows images from various types of adventures but we settled on a quintessential classical piece for the accompanying music. I don’t remember who suggested this piece—it may have been a friend in the SID world on QuantumLink. I am pretty sure we chose a classical tune since there was no royalty to worry about. The designer is really three separate programs that work together. Besides the main adventure editor, there is an intro editor for creating and editing the adventure name, author name, & intro text, and a library editor for creating and editing libraries of monsters and items. We also included a copy program that Ray wrote called Flexi-Copy. We did this to ensure that adventure authors had a program that could deal with relative files properly. Many commercial C-64 file copiers didn’t handle relative files properly back in the day. Roy did a fabulous job of making the adventure-creation process menu-driven. My 12-year-old son Kyle was able to pick it up quite quickly in 2012, and he had no prior experience with Imagery! or with the C-64, for that matter. I encourage you to read the 10-step overview in the “Using the Adventure Designer” section of the manual before diving in. And if you have not created a text adventure game before, I highly recommend also reading the “Adventure Design Theory” section. I remember spending much time hashing out the details with Roy and I thought he did a great job of educating me on how to create a fun adventure. As you spend more time with the program, you will need to read the three reference sections (one for each of the three designer modules). Appendix A is also helpful to have handy, at least until you have spent an hour or two navigating the menus of the main designer program. Eventually, you will want to understand how things work under the hood, and Appendix B is a good place to start. All of the various variables and formulas are defined there. Then, when you are really ready to dive in deep, you can start poring through Appendix C, which contains both a general overview as well as a line-by-line pseudo-code listing of the Imagery! adventure “engine”. If you have read any of the Eamon newsletters, you will know that the very best adventures included some customization of this engine (which is written in BASIC) and we believed the same would be true for Imagery! I am still proud of the effort Roy put into creating this material—it should be a real boon to hard-core adventure writers. Before Thomas’ note, I hadn’t thought at all about documenting the history of Imagery! or of Dr. Evil Labs in general. So a huge THANKS, Thomas, for getting the ball rolling. It has been fun digging up and telling the history of Dr. 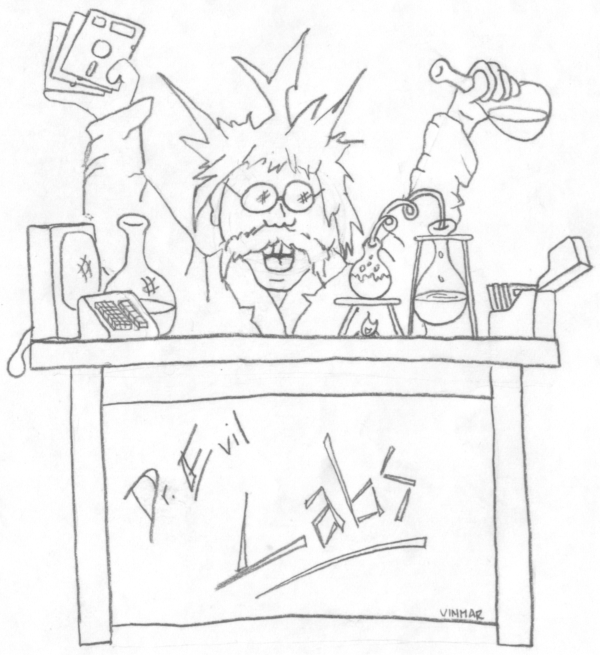 Evil Labs, in getting reconnected with some old friends, and in making some new ones through the amazing C-64 retro community. And my kids think I’m a little cooler now too.